If there was a rule book for crossovers, the Mercedes-Benz GLA would be the perfect example of execution to the T. It, after all, appears like an A-Class on stilts, with rugged looks to match. The GLA, however, was beginning to show its age and a refresh was in order. 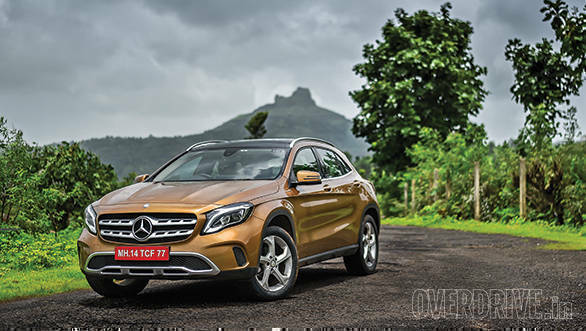 Mercedes-Benz has just introduced the 2017 GLA in India, and we have the top-spec 220d 4Matic variant on test. So, what's new? The overall design remains the same and you'll have to squint a little to notice the changes. The front end features a revised bumper and a new grille, which along with the muscular creases on the bonnet makes it look a little more aggressive. I personally like the grille and the big three-pointed star logo it proudly flaunts. It actually gels with the attractive canyon beige colour on our test car. 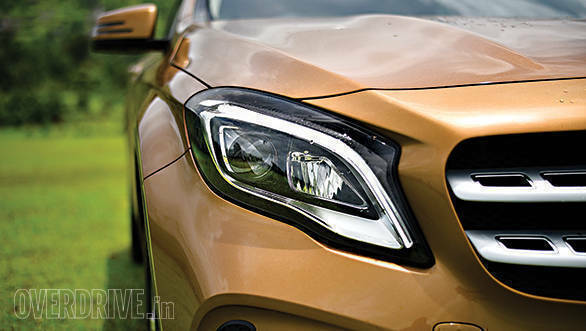 The headlamps are brand new and feature a full-LED set-up, which Mercedes-Benz regards as a high-performance unit. It certainly delivers what it proclaims as illumination at night is indeed bright and has adequate focus and spread. The side profile remains the same, but it's not that it needed any touch-ups. The crease line that begins from the headlamps and runs along the length of the GLA to disappear into the rear wheel arch is what catches your eye. This angle also highlights the GLA's hatchback roots, evident from the short pillars and small glass area. While it's not a cause for concern, the shape and size of the windows does hamper your view from the cabin. So parking in tight areas or manoeuvring in heavy traffic requires a little more attention. 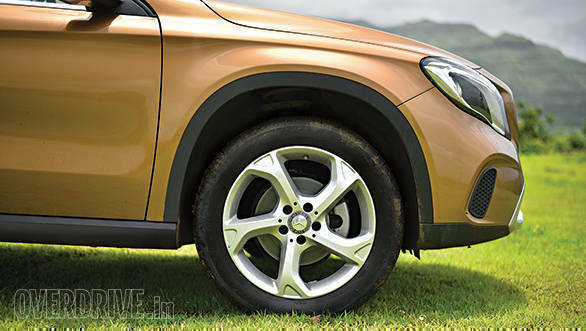 For 2017, the GLA also gets new, 18-inch alloy wheels with a five-spoke design that looks quite appealing. The rear bumper is tweaked slightly and gets a new faux skid plate along with a set of dazzling full-LED lamps. 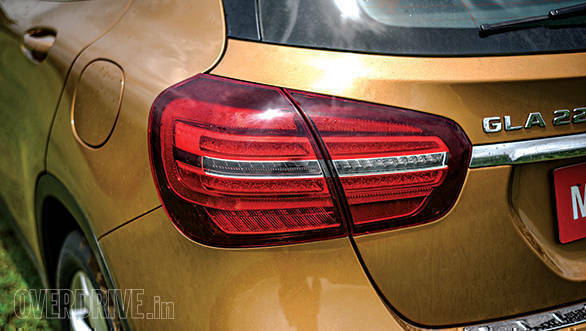 They look similar to the GLC's tail lamps, and to my eye, a bit better than the ones on the previous GLA. On the whole, the GLA looks sporty and, as I've said before, just as what the crossover rule book states. Step inside and you'll notice a familiar cabin, that's identical in layout, but just like the exterior, the changes are subtle. There's a new aluminium insert that runs across the length of the dashboard, and it stands out against the beige and black fascia. The circular AC vents look quite stylish with the aluminium bezels around them. Mercedes has introduced 12 ambient light colour options to suit your mood. The infotainment system has finally been updated and comes with Apple CarPlay and Android Auto compatibility. The graphics are crisper, but not in the same league as some of the competition. An all-new GLA, I suppose, may feature a better infotainment system. Nevertheless, the system in the 2017 GLA is better than before. The little jog dial, which helps navigate through various menus, is placed ergonomically, next to the cupholders, making it easy to operate. The seats upfront are comfy and offer good support. A neat touch is the extendable cushion that offers added underthigh support, which is a boon on long drives. The new steering wheel is similar to what you see in the new E-Class and I particularly like the perforated grip area. 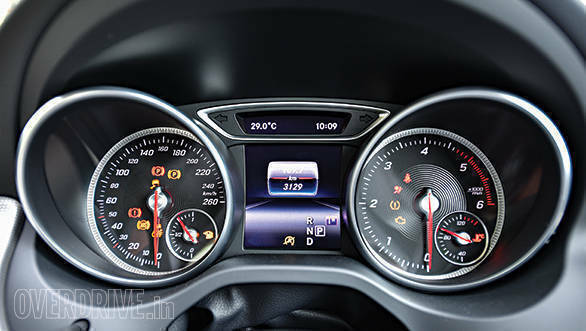 The twin-pod instrument panel has also been revised and looks quite sporty, while the colour display in between the pods shows you all the information you'd need. The rear seats can accommodate two adults with ease; however, kneeroom is just about adequate. The beige interiors and the new panoramic sunroof go a long way in making the cabin feel airy, despite the small windows. Mercedes is offering three engine options in the new GLA - one petrol and two diesel motors. The one in this car is the most powerful of the lot. It displaces 2,143cc and develops 170PS between 3,400-4,000rpm and 350Nm between 1,400-3,400rpm. The engine is mated to a 7-speed dual-clutch transmission. Crank up the engine and you notice that though it is refined, the GLA's other German competitors have slightly better in this aspect. No, it's not annoying, but it's a factor that gets taken into account, given how diesel engine refinement has reached a whole new level. A case in point being the new aluminium diesel motor in the Mercedes-Benz E220d. There are five drive modes - Comfort, Sport, Off-road, Eco and Individual. Each mode alters the steering, throttle response and the air conditioning, with Individual allowing you to tailor the car as per your preference. While Comfort is ideal for everyday driving, I'd recommend sticking to Eco only in bumper-to-bumper traffic. That's because in Eco, the throttle response is dulled to quite an extent and out on the open road, there's quite a delay between you putting your foot down and the car gathering pace. Shift to Sport mode though and the engine immediately feels sprightly. The motor revs quite quickly for a diesel, and it's amazing to see the rev needle sweep across the dial so fast. What I also liked is that in Sports mode, the throttle response is just about how you'd want it - precise. We recorded a 0-100kmph time of 9.2 seconds, and the car came to a standstill from that speed in 3.2s, covering 41.1m in the process. As far as fuel efficiency is concerned, the GLA returned 11.2kmpl in the city and 18.52kmpl on the highway. 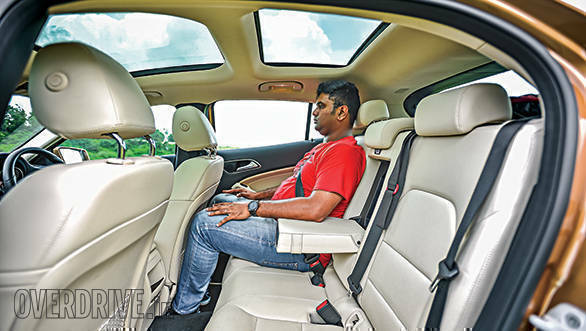 The GLA is set up stiff, so the ride is a bit bumpy at slow speeds, especially when driving over potholes or undulations. Pick up the speeds, however, and the ride does get a bit better. But the joy of this set up lies in corners, and that's where the GLA shines. 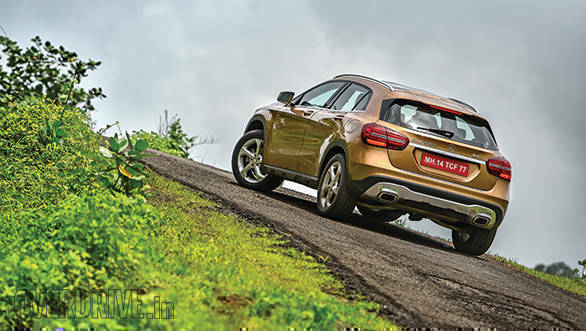 Despite its 171mm ground clearance, the GLA handles just like a car. It remains flat and true to an intended line around a corner. 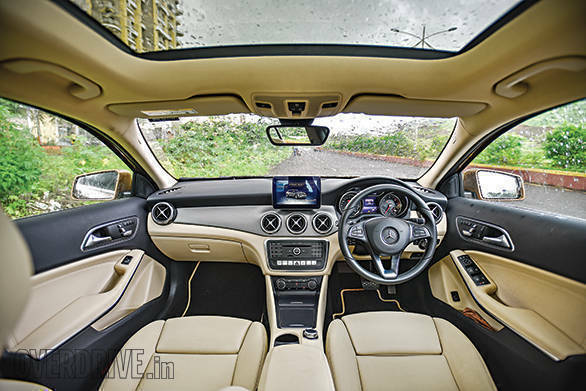 There is good feedback from the steering too, and the grip from the fat tyres and the all-wheel-drive system make the GLA enjoyable around canyon roads. This, with the added peace of mind that you won't have to worry too much about scraping the underbelly on bad roads. Driving the GLA around our shoddy roads I realised that I wasn't backing off as much I would in a regular hatchback. The GLA's extra ground clearance was what instilled that confidence in me, and the best thing is, I could still drive it at a fast clip around the bends, if the occasion presented itself. In a nutshell, if you are looking for an entry-level Mercedes-Benz with decent off-road capability married to good on-road dynamics, the GLA ticks the boxes. And at Rs 45.08 lakh (on-road Mumbai), it is priced less than the competition too.